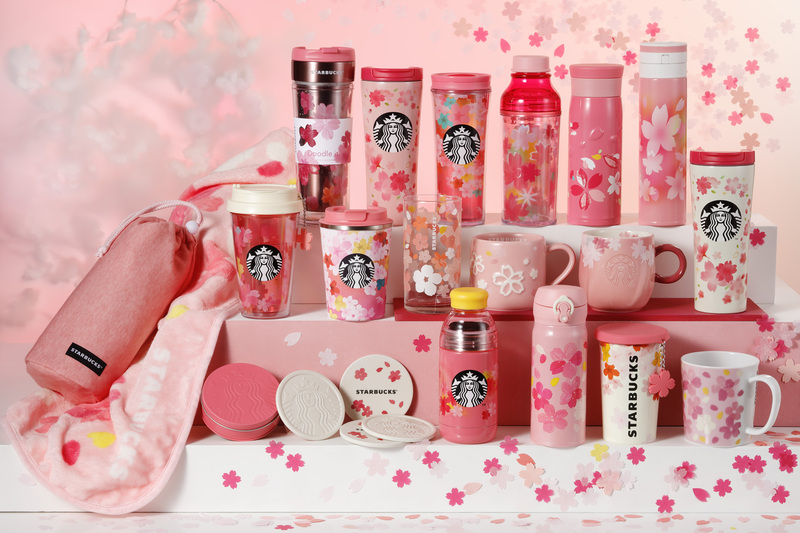 Springtime is coming to Starbucks Japan as the coffee chain has unveiled two cherry blossom inspired drinks along with a series of pink and flowery merchandise, all set to arrive on February 15, 2019. Starbucks understands the importance of representing the culture of countries and regions around the world. Since 2002, it has shown its respect for Japanese culture by creating drinks and products themed on cherry blossoms―a symbol of Japan. The official name of this year’s theme is SAKURA “Mankai” Moments -Full blooming all around you-, with mankai meaning “full bloom,” and it is set to express the moment at which the cherry blossoms are at their height. 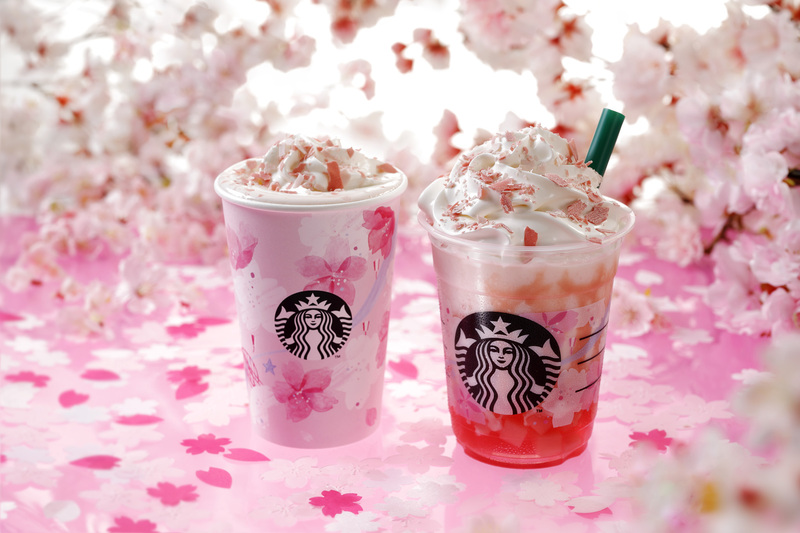 This year’s sakura season beverages are the Sakura Full Milk Latte and Sakura Full Frappuccino®. Both drinks use cherry blossoms and strawberries as their base flavour, warm and cosy ingredients that call to spring. They are inspired by the dancing leaves fallen from cherry trees in full bloom. The luscious latte is a mix of strawberries and milk for a sweet and creamy flavour. Its pink colour is reminiscent of the light pink petals while the deep pink coloured strawberries add contrast. It is finished with a topping of shaved chocolate. We also have the Frappuccino® which is made in the image of fully bloomed cherry blossoms reflecting on the surface of the water. The drink is full of sakura and strawberry sauce to express a series of cherry trees. It also contains a strawberry jelly and cherry blossom milk jelly. The jiggly texture of the jelly makes for an enjoyable drinking experience together with the strawberries. Both drinks also come with designs based on the cherry blossoms of Meguro River, one of Japan’s most famous cherry blossom sites. 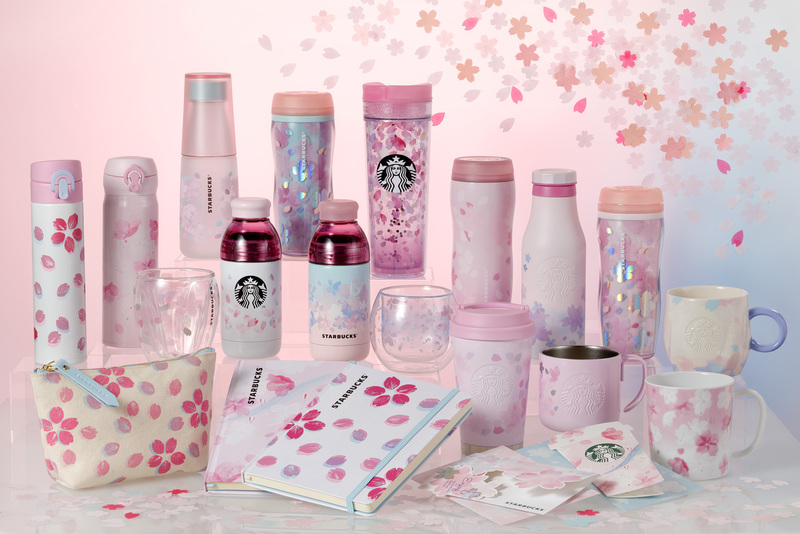 Don’t forget the cute and colourful merchandise that will be available either, with everything from tumblers to mugs and more all to make your drinking experience this year’s sakura season even more fun. The first line of merchandise will be available from February 15 with designs based on the pure image of cherry blossoms standing still in the light of the early morning. The second line arrives on February 25 and places the flowers in the sunlight of the afternoon. If you’re in Japan for the cherry blossom season then don’t miss out on these exclusive grabs. *The Sakura Full Milk Latte will be sold until March 19, 2019.